Last August I finally joined Instagram and in doing so I learned a lot about hashtags and unfamiliar terms like "flat lay". (In case you're in the dark like I was, a "flat lay" is basically an outfit post with clothing laid out on a flat surface, usually a white board, to highlight the individual pieces of clothing or accessories.) Well, in my opinion, no one does the "flat lay" better than Lisa of Respect the Shoes. Her outfit ideas are pure inspiration and always on point. So I just had to steal this one look I'm showcasing below with a black and white striped shirt and green J. Crew lace skirt. I even copied the idea of adding a pin for a bit of vintage flare. The vintage fan pin I am wearing is from the Pasadena Flea market, which is held every month in the Rose Bowl stadium in the lovely city of Pasadena, California. I tried to haggle for it, but due to my non-confrontational nature this proved to be largely unsuccessful. I suppose even if the whole pin idea wasn't my own, at least the story behind it is! Great outfit! 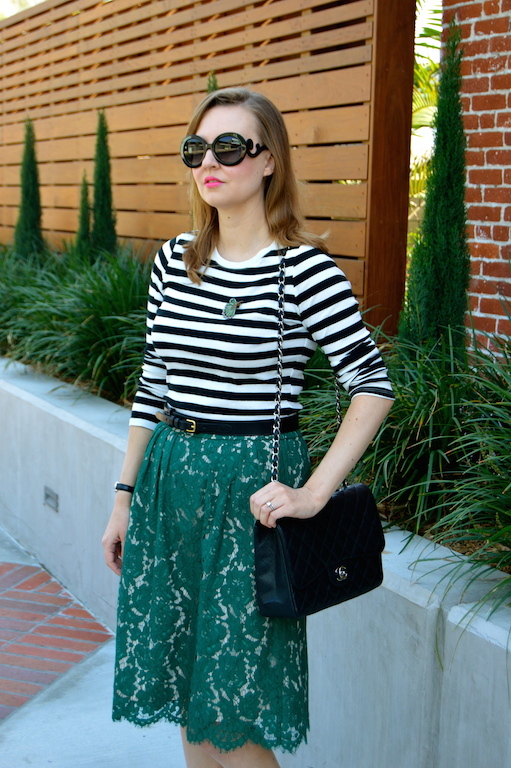 The lace skirt looks great with the striped top! And I love flat lays, so I'll check out Respect the Shoes! I remember Lisa's pin and wanting to recreate the look as well since I have the same skirt. Don't be surprised if you this outfit on me soon! 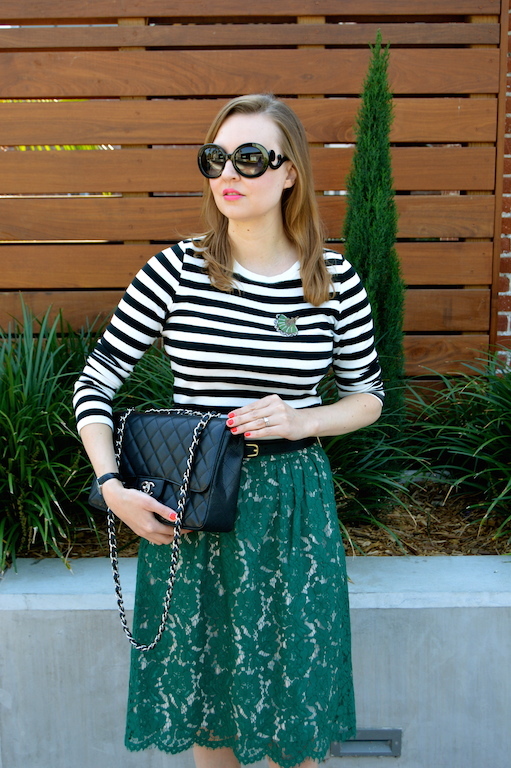 I like how you mixed the green lace skirt with the strips - and those shoes are very cute! I just love Lisa's style and she does do the best flatlays. The pin you chose is sooo pretty and compliments your look perfectly! I am already thinking how I can spin this look to work with what's in my wardrobe, so thanks for the inspiration, Katie! 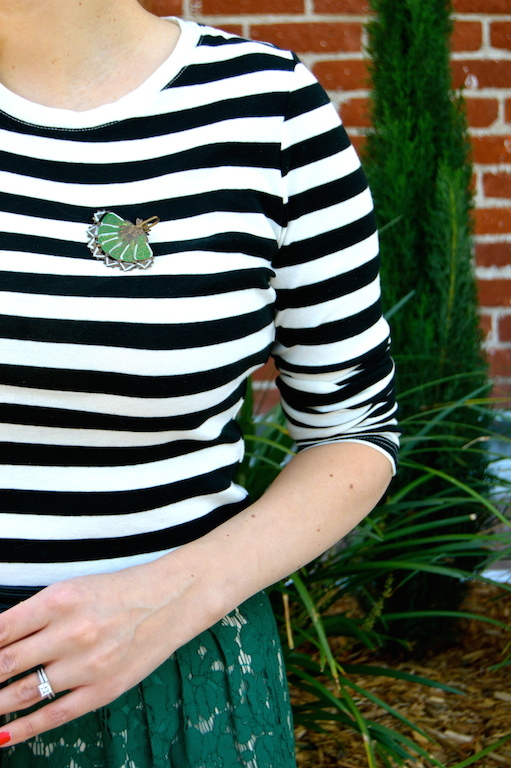 Loving the lace and stripe mix and really feeling green lately too!